JTOW is the Outreach arm of the Birthplace, charged with the responsibility of taking the gospel of the saving grace of Jesus Christ around Africa and to the uttermost ends of the earth. We believe in influencing lives one at a time while seizing opportunities to reach out to groups whenever we can. 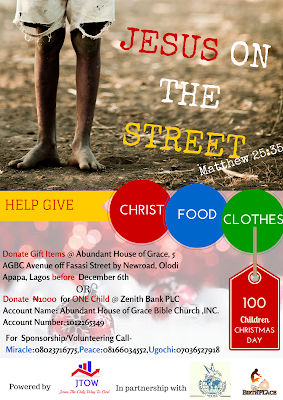 This December, JTOW hosts street children to a special Christmas tagged #JesusOnTheStreet. The event will provide a minimum of 100 street children along the bandry/Ajegunle and Apapa axis (Lagos State) with clothes and food while sharing the Love of Christ with them. You can be a part of event by volunteering or giving clothes.